Today we have another neat Free tool that we just released in Beta mode called, “The Check Image Sizes, Alt Text, Header Checks and More Free SEO Tool“. 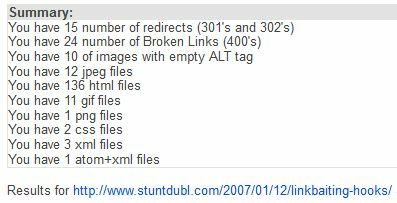 In addition, today we also upgraded the Find Broken Links, Redirects, and Google Sitemap Generator Free Tool. Here’s what the new Check Image Sizes, Alt Text, Header Checks and More Free SEO Tool does. You just enter in any URL. The tool will spider that page, making a list of all image files, html files, and all other types of file that are linked within the code of the URL you entered. The tool runs in real time so you can also watch the tool gather data about each file that is linked. It gives you a nice summary telling you how often each file type is found on the page. This tool then shows you a list of all the images, the width and height, the file size of each image, the alt text…and then you can mouse over the “view” column and see that image pop out in it’s actual size so you can see the image. Below the image analysis there is a table showing all the other file types, and the header response for each of those files as well. I hope you like it. I’ve never seen anything quite like it in the world of SEO tools… not that alone this tool is anything super duper amazing (though it is pretty cool), but today we also added this tool into our Find Broken Links, Redirects, and Google Sitemap Generator Free Tool, which now gives more information on a page-level analysis by clicking on “Image Info +” in the crawl report analysis, which will take you to our newest tool. We’ve also added a new floating bar on the top of our crawler tool so you can more easily see the summary of pages indexed, errors, and redirects. The tools are all free. If you like them, all I ask is for you to tell your friends about them too via Liking them, Tweeting them, Google Plus them, Link to ’em, Review them…yada yada. If you find bugs, please report them. These tools are all very new, and with your help, we can make them even better. We’re on a tool roll…and hold on, we’ll have several being released every week for as long as I can see into the future. Backlink & Anchor Text SEO Tool Updated – Ninja Style. Excellent! Image content is getting more and more popular! Everyone now posts screenshots, promote images on social media (Pinterest! ), get images ranked in image search results! Since we are using images so often, we need to know how to do that right! Thanks for another great tool! I am excited! Thanks for the awesome SEO swag! I can only say thanks this makes life easier 🙂 High Five!! Thanks Jim and ninjas, this looks very useful. Keep coming back here, folks. We’re far from done in creating new and valuable SEO tools. There’s a lot more to come in the near future. Thanks so much for your enthusiastic support! It really means a lot to me and our team!